I love planning my week of meals the weekend before – it really makes me feel like I have my shiz together, you know?! Batch cooking is an easy way of making sure you have good meals to hand all week, be it if you need a speedy meal to reheat or if you’re trying to keep on track with healthier eating. Since going pescatarian last year, I’ve been keen to try out meat-free options of some of my favourite meals. Chilli is one of my favourite meals, be it with grated cheese and rice for dinner or simply with a dollop of natural yoghurt for lunch. 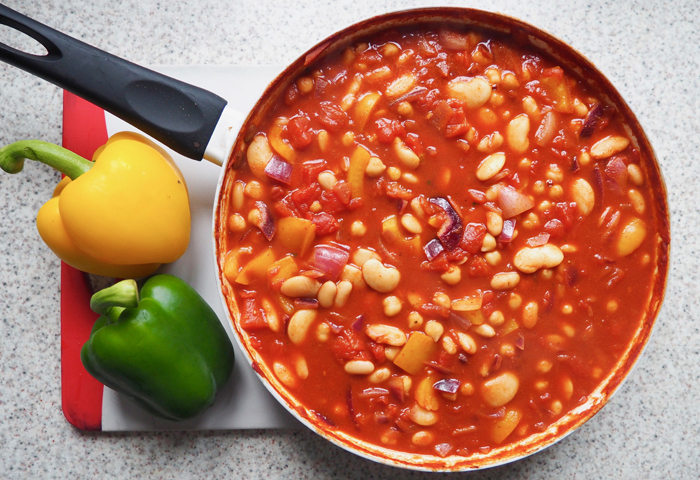 Here’s my cheap and easy three bean chilli recipe – you can’t go wrong! Add the chopped tomatoes, tomato puree, peppers, cumin, paprika and salt and pepper and simmer for around 15 minutes, stirring occasionally so it doesn’t stick to the pan. Taste to make sure it’s to your liking – you may want more spice! Drain the three tins of beans and add to the pan to cook for another five minutes. And voila – that’s it! This is a seriously easy meal to whip up on a Sunday and enjoy for a week of lunches or dinners – I would say this makes four hearty dinners portions or five smaller lunches. Serve with rice, plus grated cheese or natural yoghurt. This also freezes really well, so is a great back up dinner for when you don’t have time to cook from scratch! Delicious.